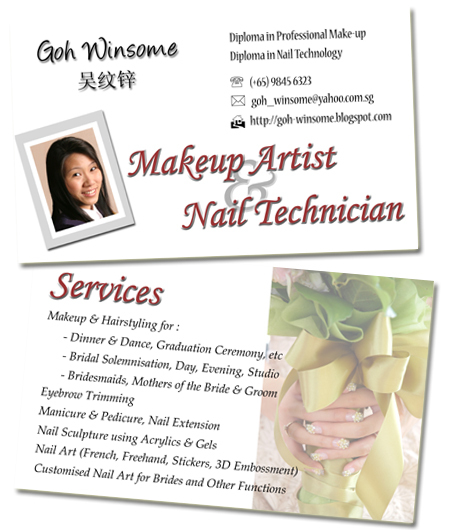 Graduated from The School of Makeup (Singapore), I was trained in doing make-up for day and night events, as well as, professional makeup and hair styling for Bridal ROM, Studio Photoshoot, Wedding Day and Evening. I also obtained both a Diploma in Professional Make-up and a Diploma in Nail Technology from the same School. Being a professionally trained nail technician, I provide manicure and pedicure services, and also nail sculpturing using the Gel and Acrylic system. In 2006, I was certified by EzFlow Nail Systems (USA) with the EzFlow Basic Certification and Advance Butterfly Certification. I am also a certified EzFlow Educator 2006-2008.